hai all, i am bumi. i have the interest on action figure but the thing is i am not bringing them here. i have got friends out there who ask me the favour of selling of the action figure in lower price but not included postlaju cost. if you have got any action figure like mc flarence adn sota toy, can refer to me for the subject matter and price. 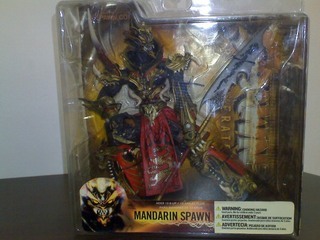 mandarin spawn is for sale. its still in the box. market price RM70 to RM80. there are other method as well, that is when i am going back to semenanjung, if you do pre-order from me you will save RM10 for each of the products you are getting on because i will bring the stock for you when coming back. so hope that my assist here can help you all to get the most of your desire.